Are you a violinist who is curious about “going electric,” but have no idea where to begin? This book will walk you through the process of choosing an electric violin, shopping for an amplifier, and using effects pedals. The book also covers improvisation in the genres of blues, rock, and funk. Chopping and other rhythmic techniques for bowed string instruments are explored, as well as playing in a band, rock string arranging and working with DJ’s. “Plugging In” will open new worlds of creativity for you as a string player and help you find your own voice in the brave new world! 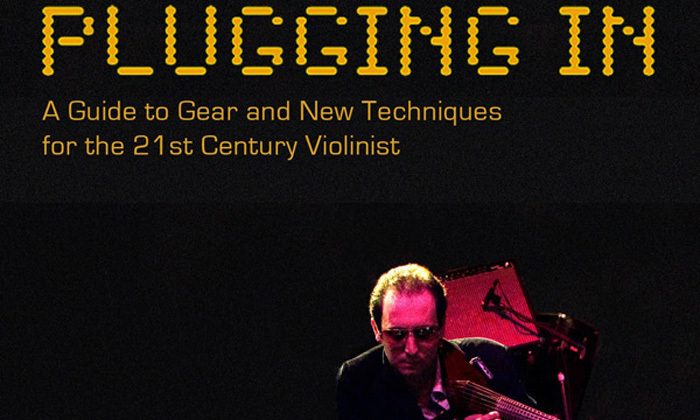 I am proud to FINALLY announce the official release of my book, Plugging In: A Guide to Gear and New Techniques for the 21st Century Violinist, from Mel Bay Publications (www.melbay.com). Mel Bay is the biggest publisher in the world for music instruction books and has been in business for over 60 years! I started working on the book in 2009 around the time my son, Max, was born. While working on the book, I was simultaneously recording and mixing the Joe Deninzon Trio Exuberance CD, and the new Stratospheerius CD, The Next World (Due out this spring), while adjusting to fatherhood. With all these projects combines with tours, recording and teaching obligations, and numerous other setbacks, I can’t tell you how ecstatic I am that this book is finally seeing the light of day. This book was truly a labor of love for me, and I want to thank my band, my manager, my family, and everyone at Mel Bay for giving me the opportunity to write it. Over the years, I have had many violin students come to me, some high school/college students and some adult professionals, interested in exploring the world of improvisation, “alternative styles,” and electric string playing. I would often get the same questions: “How do I shop for an electric violin? What kind of instrument is right for me? What kind of amp should I use? How do you do all those percussive effects? How do I work these effects pedals and what sounds are the best to use?” I wanted to answer these questions in one book. The first part of this book talks about choosing an electric violin, working with transducers, the history of electric bowed stringed instruments, amplification and monitoring. Then, I explore improvisation in the genres of blues, funk, and rock, rhythmic techniques like “chopping’ and “comping,” working with effects pedals, working with DJ’s, rock string arranging, and a myriad of other things I have had to do in my career that require skills beyond the traditional classical conservatory training. The book comes with a 70 minute CD and a 60- minute DVD, and contains over 60 musical examples!